CEREC (Chairside Economical Restoration of Esthetic Ceramics) allows us to create and implant custom-fit ceramic dental restorations in a single appointment. With the help of an infrared digital camera, 3-D imaging software, and a diamond-bladed milling unit, we construct precise and highly detailed crowns, onlays, veneers, and fillings. This allows us complete control over the material and design of your restorations, as opposed to shipping it off to a third party lab. If you want a straighter smile without dealing with metal braces, Invisalign might be for you. How does Invisalign work? With 3-D Imaging, we can project tooth movement and create clear aligners that gradually move your teeth in line with each other. We'll set you up with new aligners until your smile is exactly where you want to be! When plaque build-up leads to infection in the tissues surrounding the teeth, that is periodontal disease. We can prevent infection and treat current infections by providing you with a deep cleaning, delivery of localized antibiotics, and other treatment options. Come in a talk to one of our Dentists about your options! Here at Lake Harbor, we embrace the newest dental technology. As one of the leading manufacturers of dental technology, Sirona provides advanced 3D scanning through the GALILEOS system to help improve diagnosis and treatment planning for both patient and dentist. The images also improve communication, as they can be used to discuss treatment options. 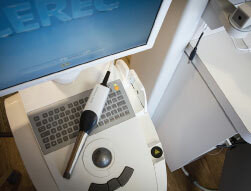 The GALILEOS system is a cone beam 3D dental imaging system used to produce high quality, three-dimensional images of the entire mouth to help your dentist accurately diagnose your condition and develop an effective and thorough treatment plan. Images are taken from a full range of different angles in just a few seconds, and are helpful in evaluating conditions such as impacted wisdom teeth, periodontal bone loss and determining the source of dental pain. GALILEOS Imaging is also used to measure bone to accurately provide a treatment plan with a surgical guide for safe, precise and successful placement of dental implants. We are proud to be the first general dentist in the Treasure Valley area to use this state-of-the-art technology.